Cedarwood essential oil is one of the highest quality, multi-purpose, and most importantly natural beauty remedies that you can find. From insect repellant to hair treatment, Cedrus Atlantica is truly worthy of a spot in your regular body and skin care routine. One of the most popular uses for cedarwood oil is as an astringent. Using toners made with pure cedarwood essential oil, or even diluting a few drops of cedarwood essential oil in a carrier oil, can show amazing results for oily and acne-prone skin. We’ll give you the breakdown on astringents, and tell you how to cycle in cedarwood oil for added benefits! When it comes to skin care, one of our go-to ingredients is totally natural and pure cedarwood oil: scientific name Cedrus Atlantica. The scent of cedarwood oil of this genus (which is a TRUE cedarwood) will have a sweet, balsam aroma. Cheaper cedarwood oils will have a less crisp, more stale woodsy smell. Cedrus Atlantica is an ingredient with a long history and an incredible set of topical and aromatherapy properties. Cedarwood oil is derived from the giant cedar tree, abundant in north America, and thus part of a sustainable extraction process. The oil is obtained from the wood chips and sawdust of cedar trees through a process of steam distillation, resulting in a golden oil with a crisp, woody aroma. Cedarwood oil is also thought of as an emotionally grounding aromatherapy oil, used in holistic medicine as a relaxant and anti-anxiety tonic for patients suffering from insomnia. In addition to its rejuvenating aroma and therapeutic uses, the benefits of cedarwood oil for skin care should also be praised — especially when it comes to treating acne, inflammation, and excess oil. We love using this ingredient for its astringent properties — but what does that mean for your skin, and why should you care? What Is an Astringent, and Why Should I Use One? The term astringent refers to a water-based solution that contains some sort of solvent, which can cut through oil and dissolve superficial lipids on the skin’s surface. The term sounds a lot more harsh than it should, making you think you’re using a product so strong it will cause burning or skin irritation. If you’re using natural astringents, that won’t be the case at all. If you suffer from oily skin, enlarged pores, or acne, incorporating an astringent into your skin care routine is a must. It’s an essential step – to be applied after cleansing and before moisturizing – that will leave you with tightened pores, stabilized oil production, and overall reduced unwanted shine. The astringent family includes ingredients like witch hazel, apple cider vinegar, kombucha, vodka, and cedarwood oil – all of which are natural tonics that complete the cleansing process. Astringent comes in handy in order to fully remove debris from your dermis post-cleanse. After using a cleanser, you’re typically left with trace amounts of oil or soap on your face, which can lead to future irritation and breakouts, or overall dullness. Astringent completes the cleansing process, fully preparing you for maximum absorption of your moisturizer. And maybe most importantly, astringent is intensely antibacterial, meaning that its application wards off infection, irritation, and blemishes caused by overgrowth of bacteria. If you want to learn more about the importance of cleansing bacteria from your skin, check out vetiver oil and sage oil for soothed, clearer skin. 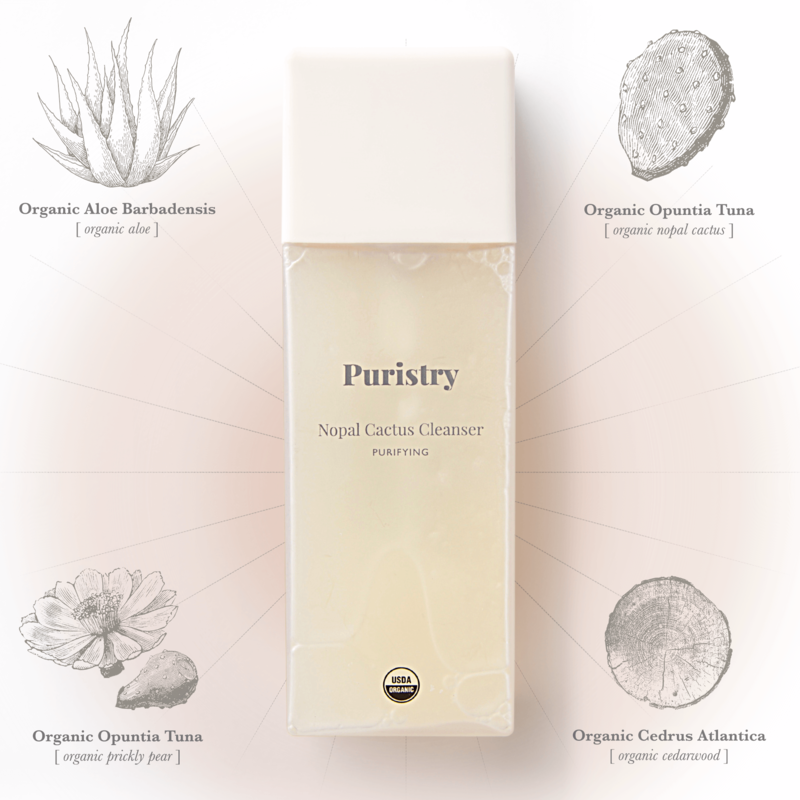 At Puristry, we stay away from alcohol based astringents, which can cause excessive drying and be disruptive to your skin’s pH balance. The primary elements in our old friend cedarwood essential oil are alpha cedrene, beta cedrene, cedrol, widdrol, thujopsene, and a group of sesquiterpenes, all of which contribute to the oil’s toning, antiseptic and anti-inflammatory properties (these chemicals can also be found in patchouli and black pepper oil, and endow formulas with clarifying properties that enhance skin-cell turnover). With this chemical profile, cedarwood oil is an effective treatment for skin conditions that are caused by overactive sebaceous glands – like acne and eczema – and can also be used to reduce inflammation around active blemishes and other irritations and imperfections. What’s more, it’s an effective remedy for fungal infections, preventing wounds from becoming septic as well as protecting them from tetanus germs. We incorporate cedarwood oil into our clarifying cleanser and toner formulas, thanks to its natural ability to clear skin, tighten pores, and protect your outer dermal layers from bacteria and toxins. When used as part of a clarifying routine, it enhances skin tone over time, contributing to a more even canvas, in both texture and tone. Armed with these benefits, cedarwood oil features in our super skin-loving Nopal Cactus Cleanser, an extra gentle cleanser which is both calming and clarifying. The formula features cedarwood oil for its anti-blemish and toning properties, plus nopal cactus, another skin care overachiever with a high antioxidant content as well as Vitamin A and C for enhanced skin-cell turnover and increased elasticity. The formula also benefits from the inclusion of organic vegetable glycerin for softening and humectant action, and organic honeysuckle extract, which boasts ultra anti-inflammatory and anti-bacterial chlorogenic acid. The takeaway? Our Nopal Cactus Cleanser is a must-have for all skin types, with a synergistic blend of both clarifying and moisturizing plant-based ingredients. Cedarwood oil also enhances our Flower Water Toner, a Puristry favorite that reaps the benefits of cedarwood oil, alongside its sister organic astringent witch hazel distillate, another natural clarifier that helps remove excess oil and banish bacteria. This clarifying duo is enhanced with the ultra-calming and hydrating properties of rose and calendula hydrosols, both of which are highly effective when it comes to soothing redness and promoting even skin tone. Adding a facial toner to your skin care routine is essential — and this is an all-purpose toner that’s gentle enough to use daily. Apply it before serum or moisturizer, as it helps remove excess oil, balance skin pH levels, and prepare pores for the deepest possible absorption of active ingredients that you’ll be applying next. It can be used as both a daytime and nighttime skin refresher, and is especially helpful for dealing with inflammation. Think of it as a glass of water for your skin that simultaneously wards off clogged pores. The best part about cedarwood oil? It’s mild enough to work in a super gentle toner. While astringent simply refers to an ingredient with solvent properties, toner refers to a product that’s water based, contains active ingredients to lock in moisture (like plant extracts and essential oils), and often an astringent element to remove excess grime and pollution from day-to-day exposure. Cedarwood oil works as an astringent in our formulas, but doesn’t strip or over-dry, and compliments the humectant action of other ingredients that work to lock in hydration. It’s a balancing ingredient that tightens pores without irritating. When applying our cedarwood oil based products, make sure to massage thoroughly into your skin to reap the full benefits. Facial massage is an incredible way to stimulate blood flow, reduce swelling, and enhance collagen production, and is a powerful method to manually encourage deep absorption of a product. Plus, facial massage can encourage firming and lifting of skin that’s less taut than it used to be – our Seven Techniques for Facial Firming Massage Guide will take you through these spa-worthy steps. Keep up with us here for more ingredient spotlights and plant-based beauty guides. Get alerts on the latest skin care hacks! Should an Organic Face Wash Foam?